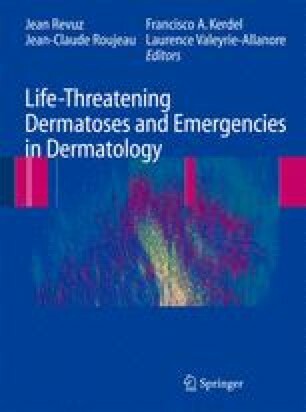 Stevens–Johnson syndrome (SJS) and toxic epidermal necrolysis (TEN) are severe, druginduced skin reactions with a high morbidity and mortality. A consensus definition has allowed several epidemiological studies to estimate the risk of associated medications. Drugs with a high risk to induce SJS and TEN are allopurinol, antibacterial sulfonamides including sulfasalazine, carbamazapine, lamotrigine, nevirapine, oxicam-NSAIDs, phenobarbital, and phenytoin. Identification and withdrawal of the inducing drug(s) is crucial for the progression of the disease and the prognosis of the patient. Supportive management is important to improve the patient's state, probably more than immunomodulating treatments such as intravenous immunoglobulin, corticosteroids etc. that have been tried so far.